This will be my FIRST night market at the Biscuit Mill. Last year I went as a shopper and had a really good time – good food, good people and good fun. However this year it will be a little different as I will enjoying the festivities with my bags, standing behind. Click to find out where, what and who (last year’s pics from skinny’s blog). This entry was posted in Blog and tagged Biscuit Mill, christmas market, market, Neighbour goods market, nigh market, salt River, Xmas night market. I saw your gorgeous little stand at the Night Market yesterday evening and your goodies looked so divine. Well done! 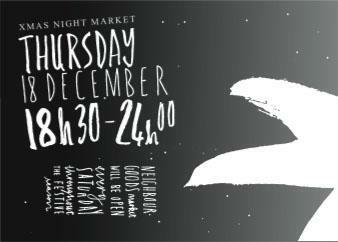 Oh this sounds good!I hope you had a nice Christmas night market and much success!